It’s Monday! And that means you get something awesome for free. 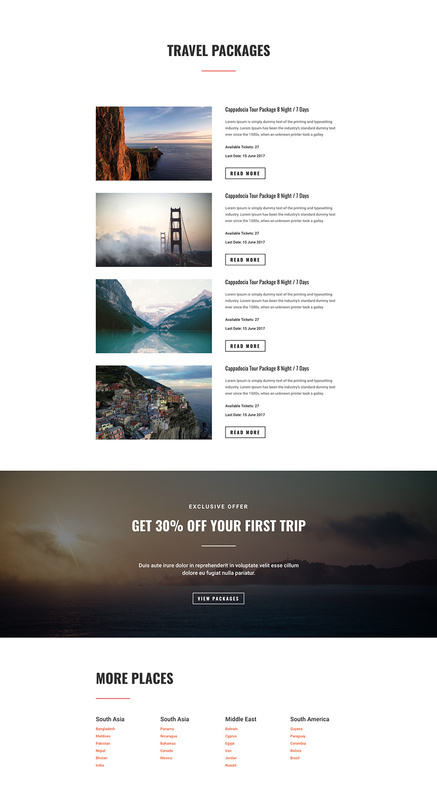 Today, we are giving away a Divi Layout Pack for a Travel Website. With 8 different page layouts to choose from, you should have everything you need to have a fully designed Travel site up and running in minutes. The Travel industry is booming. Everyone is searching online for their next great destination. So it doesn’t really make sense to downplay the significance of a well-designed travel website. 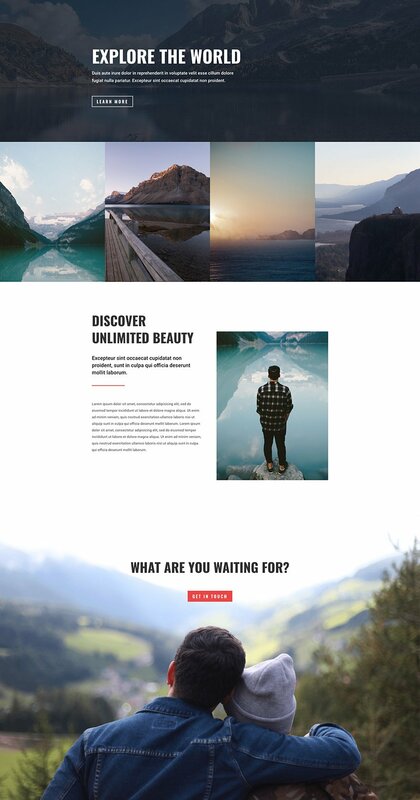 If you need a website designed for you travel business/blog, need a web design upgrade, or need a pre-made travel layout to jumpstart your next Divi project, today is your day. In this post we give you a thorough preview of the layout pack including fullpage screenshots of all 8 page layouts and links to live demos for each page. We will also give you instructions on how to download and install the layouts on your Divi Theme. To use the Travel Layout Pack on your own Divi website, you will first need to download it using the button below. To gain access to the download you will need to subscribe to our Divi Daily email list by using the form below. As a new subscriber you will receive even more Divi goodness and a free Divi Layout pack every Monday! If you’re already on the list, simply enter your email address below and click download. You will not be resubscribed. Join the Divi Newlsetter and we will email you a copy of the ultimate Divi Landing Page Layout Pack, plus tons of other amazing and free Divi resources, tips and tricks. Follow along and you will be a Divi master in no time. If you are already subscribed simply type in your email address below and click download to access the layout pack. You have successfully subscribed. Please check your email address to confirm your subscription and get access to free weekly Divi layout packs! Once you have downloaded the layout pack, locate the layout-pack-travel.zip file in your downloads folder on your computer. Double click the folder to unzip it and then navigate inside the layout-pack-travel folder. Inside this folder you will find 8 files, each of which is a unique layout that you can import into your Divi Library. To do so, navigate in your WordPress Admin to Divi > Divi Library > Import & Export. You can select the individual layout you desire or choose the All Layouts file to important everything at once. 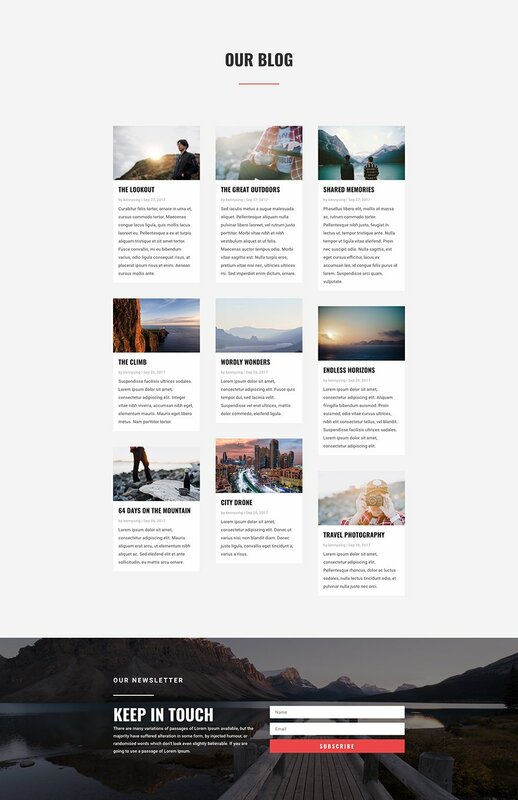 To load one of these layouts onto your page, activate the Divi Builder and then look for the “Load From Library” icon in the page settings bar (it looks like a plus symbol). Click this icon to launch the Load From Library popup and then navigate to the Add From Library tab. Here you can choose any of the eight layouts we’ve included in this pack to add to your page. I hope you enjoy this travel layout pack. Don’t forget to check back every week on Monday to download a brand new layout pack! Jason started a career in education before co-founding Launch Tower, a Houston based web development company specializing in conversion optimization through Divi. He enjoys freelance writing, all things WordPress, and the occasional ping pong match. I wonder if these all will be “stunning” each Monday. Can You help me to fix this problem? Try to upload one theme after you extract the Zip Files. If you are not using Shared Hosting – contact your Hosting Provider. I love this entire idea and those layouts are amazing, but how can we use single photo from this pack if they are not included as photo files? We have to install layouts and then import/export photo files through WordPress? Wouldn’t it be easier for users if You just include photo files directly in the zip file so everyone who wants to use single photo, and not entire layout, could simply use it? Thanks for the suggestion Martin. We are in fact looking at the best ways we can release just the design elements used in these layout packs. Based on the pace at which we’re creating new elements, look to see 1-2 freebies a month that feature just the photos and other custom design elements. you could of course download pics from the live demos. When you upload the files, you can get those files in your Media Library. Good catch Eugene. The Button text color is too light on hover for that background image. I would go do button settings and update the Button Hover Text color to #1a1a1a in the design tab. This is great. This is just great. Tell me, ET, what can I do to thank you for these layouts. I don’t think what I’m paying annually is enough. 1000 thanks to you. I feel the same way! Now I did purchase 2 lifetime subscriptions, personal and convinced my work to also go the divi route, but it still seems like a steal with the amount of stuff they release. Looks fabulous and what a timesaver! This is truly fantastic. I am so gland I changed from another theme to Divi. Thank you so much. I appreciate the mind reading! Just purchased a travel site domain yesterday, now let the fun begin! Many thanks! I like this so much I am replacing a couple of pages on my website (in maintenance at the moment). But I like even more the stylesheets you used for this theme compared to what I am currently using. Is there a way to utilise the stylesheet? Where can I download it from to replace my current one? I am using the divi child theme so can test it out. Welcome. And when does the system browser appear? Thanks guy’s,… Beautiful as usual. Can someone remind me how to download these without having to sign up for a newsletter each time. I have a big question, the first design package “Wedding” the import indications are different. The import is from the in C.V directly. But now, this new “Travel” design says: import from the “Divi library”. I do not understand, Why sometimes it should be imported from the DIVI library and others directly from the in C.V? The ET team should define a single mode of import really all this is confusing on many occasions. From what I can see the introduction of these themes is a work in progress, being refined at each iteration. The intention is to eventually have these themes available from directly in a UI in Divi. I suggest though that they should not be automatically installed and be like a web viewer (like browsing for WP plugins) on the second tab of the Divi Library with our savings in the first. Thanks for the question. We are aware of this and for now I would suggest importing through the Divi Library as currently it is the preferred method. Hi Craig, layouts do not include the navigation, you set this yourself via wp-admin. Thanks, is there a resource for stylized navigations we can use? That would be really cool. Really nice design. Simple and uncluttered which gives the layout space to breathe, plus some elegant (no pun intended) touches. Wow this is really a beautiful layout. Elegant Themes, you guys are the best in the business. Thanks for all your hard work. You guys always make me so excited to see what’s next. Well played! 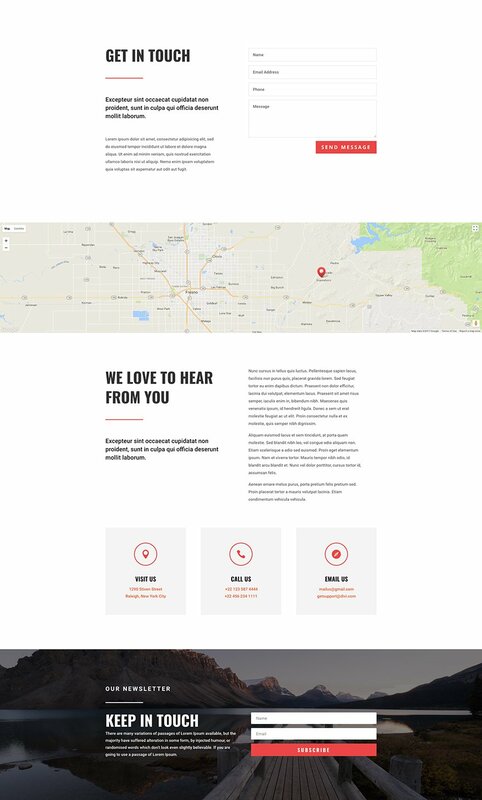 I’m actually enjoying these demos as great web design inspiration in general, even if I’m not planning on building a travel website any time soon. There are some really nice design features here, like the parallax footer and more. Is it possible to just download to images? Maybe it would be possible to offer them in a zip file or a separate gallery? Thank you. So glad you are enjoying the demos. In regard to your question, please see Nathan’s reponse to MartinMaxKing above. Yes you will need WooCommerce installed for that page to work properly. Loving the new layouts, quite inspirational! …did I recall you said at some stage you would be creating a photo resource (which again is really a cool idea)? could we get the same for a Coaching site or a finance site ? Thanks for the suggestions, Julien. We are currently working on packs for many different business types. Suggestions always welcome. Hi,Thanks for this travel pack. will the images be available somewhere to search/download somewhere on ET separately from the layouts? Good question. I’m not sure at the moment. Craig, we are working this out. This vertical will obviously grow rapidly over time and we want to make sure handle it gracefully. Definitely at the front of our minds. Would be good if you could release designs that would be more useable/focussed for small businesses/shops. Like florists, photographers, resturants, etc. That we can use for clients websites. Seem to be aimed at individuals/end user blogs of their travels and weddings so far. Oh, don’t you worry 😉 Lot’s more to come. Tried using these. It seems to have a colour block over everything. When you go to preview, it flashes up the design, but then gets ‘blocked’ by a block of colour. Any ideas? haha! I like to think so. And thank you. I agree that they are beautiful. The design team did a great job. 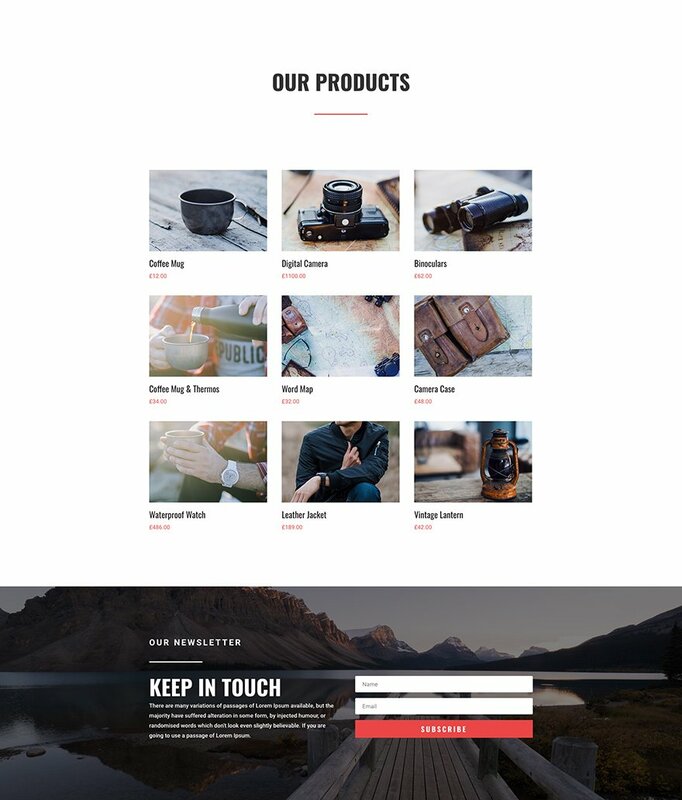 Hey Mate, thanks for sharing another layout, i am working on Divi Theme from last 6 years, thanks to my friend Nic who recommended this theme and now i am glad to see these types of free layouts which helps me a lot to expedite the design process. Make sure that your are uploading from within the divi library page (navigate in your WordPress Admin to Divi > Divi Library > Import & Export.) . If that doesn’t work. I would suggest updating your theme and trying again. I used one of these pages and for some reason can only edit it in the page and not in Visual Builder. Is it the animation stuff? When i go into Visual Builder the text kind of appears and then goes away. Sorry Chris. Maybe try updating Divi if you haven’t already. Is there a standalone download of all the images used? HuUGE mistake! You must first click on “Replace the existing content with loaded layout” before proceeding or it will replace your entire content. is the download link disabled? Hi. Is there any link to download the images? I downloaded Divi in March 2017 and wanted to download your travel theme too. I log in but then cant see how to download or upload the the relevant theme and update the existing Divi theme. Dont understand why I cant see this easily.